Why be baptized? WHAT IS baptism? Is it a religious "rite" required by this or that church? Should it be done in infancy? Should you be sprinkled, poured upon, dabbed at with a damp cloth — or immersed? What is a valid baptism in God's sight? "REPENT!" screamed the panting, perspiring evangelist to a crowd of avid followers in Brooklyn, New York. It was a hot, steamy, sweltering day, with the heat assailing them in waves from the blistering pavement under their feet. As the hoarse voice of the street corner evangelist grew in fervor and intensity, the excitement of the crowd mounted. Finally, an impassioned street corner plea for repentance was given. Dozens rushed up — tears coursing dusty rivulets down flushed and perspiring faces as they were swept along on the crest of a tidal wave of human emotion. They were baptized — right then and there. The evangelist had secured permission from the city Fire Department. He turned on a street-corner fireplug, and SPRAYED THE WHOLE CROWD — with a fire hose! At that same hour, on a Sunday morning, a cultured, well-dressed young couple stood solemnly, proudly holding their infant first-born before the pastor in a fashionable Methodist church. The pastor graciously sprinkled a few drops of water over the wee bit of humanity. The baby had been baptized. The scene shifts again. A baptizing service is in progress in a Baptist church. In waterproof costumes and black robes both the pastor and candidates step down into the tank of water. The pastor bends the candidates over backward, completely immersing them under the water. Is this the proper mode of baptizing? Simultaneously, unknown to any of these participants, still another baptizing service is under way, far outside the city. In a swiftly running stream a minister is immersing a number of candidates, also burying them completely. But this minister shunned the water of the baptizing tank. He buried them in the running stream. Was this baptism more valid than the others? Pouring, sprinkling, immersing. Indoors, outdoors. Babies, being sprinkled. Some adults being required to repent. Others baptized on profession of Christ without any repentance. In many churches there is no baptizing whatever. But it seems that in all there is CONFUSION. Does anybody KNOW which is right? Does it make any difference which WAY — or whether one is baptized at all? WHY such confusion? He warned you would be living in a world literally filled with religious confusion. He said, "Take heed no man deceives you. For many shall come in my name, saying I am Christ; and shall deceive many" (Matt. 24:4, 5). Notice Christ said MANY would be deceived, and that MANY would come "in His name," that is, using the name of Jesus Christ as if they had His authority. He said, "And, many false prophets shall rise, and shall deceive many" (Matt. 24:11). In the hodge-podge of conflicts, schisms, splits, divisions, arguments, personal interpretations, and private philosophies that make up our Western world of Christian religion — one starkly clear fact stands out: These plain-spoken prophecies of Jesus Christ have come to be true, LITERALLY! Today, there are well over TWO HUNDRED different recognized "denominations" — each professing to be preaching and teaching exactly what is in the Bible — and enough other schisms and splits, or independent :organizations" to make up more than 400 differing bodies in the Western world of Christianity! Can They All Be Right? The average person is inclined to say, "But SURELY all these churches can't be wrong?" Jesus Christ of Nazareth SAID the great majority WOULD BE! Most never think to put it this way: "SURELY, all these churches CAN'T BE RIGHT!" All you need to do is simply add two and two together. The very fact there ARE so many different views proves, in itself, the latter statement! No, they CAN'T all be right! The dilemma facing each layman, then, is to find out WHO is right, and how you can PROVE IT! Remember, the Apostle Paul said, "Prove all things; hold fast that which is good" (I Thes. 5:21). Isaiah said, "To the law and to the testimony: if they speak not according to this word, it is because there is no light in them" (Isa. 8:20). The Apostle Paul taught a group of Jews in Berea who were, "more noble than those in Thessalonica, in that they received the word with all readiness of mind, and searched the Scriptures daily, whether those things were so" (Acts 17:11). Remember! "All scripture is given by inspiration of God, and is profitable for doctrine, for reproof, for correction, for instruction in righteousness" (II Tim. 3:16). THAT is why we constantly say, "Don't believe ME, don't believe us, unless or until you check up, and PROVE everything in your own Bible!" Be sure you DO carefully prove, to your own complete and total satisfaction, that you know the plain truth about baptism — by checking up on these scriptures in your own Bible! Jesus Christ of Nazareth was baptized! Later, you will see baptism is an outward symbol of the BURIAL of the old self, and of the resurrection to life — to live in a new and a different way! Baptism is commanded as an outward sign of our REPENTANCE, and willingness to surrender our lives completely to God — being willing to bury the old self. Jesus never sinned! He did not NEED to be baptized as a repentant sinner — but only because "Christ also suffered for us, leaving us an example, that you should follow His steps" (I Pet. 2:21). Christ's baptism, then, was an EXAMPLE to all true Christians. "Then cometh Jesus from Galilee to Jordan unto John, to be baptized of him. But John forbad Him, saying, I have need to be baptized of thee, and comest thou to me? And Jesus answering said unto him, Suffer it to be so now: for thus it becometh us to fulfill all righteousness. Then he suffered Him. And Jesus, when He was baptized, went up straightway out of the water: and, lo, the heavens were opened unto Him, and He saw the Spirit of God descending like a dove, and lighting upon Him: And lo a voice from heaven, saying, This is my beloved Son, in whom I am well pleased" (Matt. 3:13-17). Notice! Jesus said, "Permit it to be so now — for thus it becomes us to fulfill all righteousness." John RECOGNIZED Jesus did not need to be baptized, but that, rather, JOHN was the one who needed baptism! Jesus was setting us an EXAMPLE to follow. After Christ's trial in the wilderness, He "began to preach and to say, REPENT, for the Kingdom of heaven is at hand" (Matt. 4:17). Jesus' message was that of REPENTANCE. But Christ really meant it. He meant to really repent — not just experience an emotional upset or disturbance. God says, "For godly sorrow worketh REPENTANCE to salvation not to be repented of, but the sorrow of the world worketh DEATH! (II Cor. 7:10). There is a "sorrow of this world" which is sheerly human and physical — it is EMOTIONAL — but it works death. What about it? Do YOU know the difference between sheer human emotion, which would even lead some to sob and SHED TEARS as they "go down the aisle," and GODLY SORROW which leads to real repentance? Jesus said, "Except you REPENT you shall all likewise perish" (Luke 13:3, 5). In His parable of the one lost sheep, and the "ninety and nine," Jesus said, "I say unto you that likewise joy shall be in heaven over one sinner that REPENTS more than over ninety and nine just persons, which need no repentance!" (Luke 15:7). Jesus gave this example to show what a RARE thing it is when one really repents. If you have never read our article on the Bible definition of REAL REPENTANCE — then write for it immediately. Peter, preaching on the Day of Pentecost in 31 A.D., said, "REPENT, and be baptized every one of you in the name of Jesus Christ for the remission of sins, and you shall receive the gift of the Holy Spirit" (Acts 2:38). Later, He said, "Repent you therefore, and be converted, that your sins may be blotted out, when the times of refreshing shall come from the presence of the Lord" (Acts 3:19). Many were deeply convicted as a result of the fantastic MIRACLES they had seen, and the almost incredible fact of the resurrection of Jesus Christ! God says, "Then they that gladly received His Word were baptized: and the same day there were added unto them about three thousand souls" (Acts 2:41). Notice, the very FIRST thing they did after really experiencing true repentance was to be baptized! The Apostle Paul wrote to the Ephesians, "There is one body [one True Church of God] and one Spirit [the Holy Spirit of God] even as you are called in one hope of your calling; one Lord, one faith [body of belief, true DOCTRINE] ONE BAPTISM, one God and Father of all, who is above all, and through all, and in you all" (Eph. 4:4-6). Notice it — there is ONE baptism! That is, there is only one valid, authorized, right baptism according to the divinely inspired Word of God! There are not two or three different modes or methods, not several different manners in which it may be done — each one as "acceptable as the other." God did not leave it up to this world to devise some "form" of man-made religious rites, attaching the NAME of Christ to it, and calling it Christian! God allows us to decide, not WHAT will be our method or mode of worshipping and serving Him, but WHETHER we will obey the ONE mode which He, the Creator, has set before us! What, then, Is that "one baptism"? The Greek word baptizo means to submerge, to immerse, to bury, to plunge into! The very word itself can, at NO time, mean anything other than to submerge or to immerse, fully, in water! Notice again the example you read in Matthew 3:13-17. Jesus came to find John on the edge of the river Jordan! But why there? If Christ had wanted to authorize the sprinkling of infants, or "pouring" of water out of a pitcher over someone's head, why did He go all the way to the river Jordan? Notice, "And Jesus, when He was baptized, went up straightway OUT OF the water!" (Matt. 3:16). What was Jesus doing IN the water — if the mode or method He intended to authorize were that of sprinkling or pouring? Notice Mark's account: "And it came to pass in those days, that Jesus came from Nazareth of Galilee, and was baptized [the Greek word means submerged, buried, or immersed!] of John IN Jordan. And straightway coming up out of the water, He saw the heavens opened, and the Spirit like a dove descending upon Him" (Mark 1:9, 10). Notice further, that the baptism of repentant believers required MUCH water, not just a cupful, or a few handfuls. "After these things came Jesus and His disciples into the land of Judea; and there He tarried with them and baptized [read John 4:1-2, however, which states that Jesus Himself did not baptize, but His disciples or students acted in His behalf] and John also was baptizing in Aenon near to Salim, because there was MUCH WATER there, and they came, and were baptized" (John 3:22-23). John had gone to this specific location because there was much water available for baptism! Baptism, IS, then, a total submerging into the water as a sign of the BURIAL of the old self! Have you ever seen a funeral where a corpse was left lying above the ground, and a few handfuls of dirt sprinkled over its head? Of course not — this would be absolutely ridiculous, and contrary to all laws of health and common sense! Notice how Paul explains it, in Romans 6. "Know you not, that so many of us as were baptized [immersed!] into Jesus Christ were baptized into His death? Therefore we are BURIED with Him by baptism into death, that, like as Christ was raised up from the dead by the glory of the Father, even so we also should walk [live) in newness of life" (Rom. 6:3-4). Baptism symbolizes BURIAL! The Apostle Paul said, "I am crucified with Christ: nevertheless I live; yet not I, but Christ liveth in me: and the life which I now live in the flesh I live by the faith of the Son of God, who loved me, and gave Himself for me" (Gal. 2:20). God commands, through Paul, "I beseech you therefore, brethren, by the mercies of God, that you present your bodies a living sacrifice, holy, acceptable unto God, which is your reasonable service. And be not conformed to this world: but be you transformed by the renewing of your mind, that you may prove what is that good, and acceptable, and perfect, will of God" (Rom. 12:1-2). If a person is experiencing TRUE repentance, he is literally GIVING his own self to God! He is reckoning himself DEAD, so far as sin is concerned, but alive through God and His Son Jesus Christ! "Likewise reckon ye also yourselves to be dead indeed unto sin, but ALIVE unto God through Jesus Christ our Lord. Let not SIN [and sin is the transgression of the law (I John 3:4) therefore reign in your mortal body, that you should obey it in the lust thereof" (Rom. 6:11-12). Remember, "The wages of sin is DEATH!" (Rom. 6:23). Since ALL have sinned (Rom. 3:23) and come short of the glory of God, and since the wages of sin, which is the breaking of GOD'S law (I John 3:4) is DEATH — therefore baptism symbolizes that death! And it is only a symbol! Christ died in our stead! We do not NEED to die! But we DO need to symbolize the death of our "old man" by being symbolically buried underneath the water in baptism! "For if we have been planted together in the likeness of His death, we shall be also in the likeness of His resurrection, knowing this, that our old man is crucified with Him, that the body of sin might be destroyed, that henceforth we should not serve sin" (Rom. 6:5-6). Though Christ died for our sins — He nevertheless demands our OBEDIENCE to His example and His command that we typify the crucifixion and burial of the old self, by being immersed into a watery "grave," and being raised up immediately as if in a resurrection, to live in a totally different manner! This is the ONLY authorized "mode" of baptism given ANYWHERE in the Bible — and any other method or "mode" devised of man is absolutely contrary to God's inspired Word, and is not VALID! Surely it must be a terrible travesty to God to see a literal carnival made of such a deeply PERSONAL and absolutely serious event as the baptism of a sinner, symbolizing the death and burial of the old self, and as an outward sign of total repentance! WHEN Should Baptism Be Done? Surely, in the light of the scriptures you have already read, the answer to this question is obvious. Since baptism is an outward sign of total REPENTANCE, and of the willingness to BURY the old self, it never SHOULD be done to infants! Baptism symbolizes the putting away of the life of sin! It symbolizes the death and burial of an "OLD SELF!" It does NOT constitute some "magical formula" for getting oneself into the "good graces" of God! Baptism is NOT a secret ritual for "joining a church." Baptism is NOT a "christening" of a baby at birth! Baptism is not valid if it is done by pouring, sprinkling, dabbing with a damp cloth, or cavorting under a fire hose! Baptism is not for children! It would be a very RARE thing if a young teenager of even 16 or 17 is truly READY for baptism! There have been cases where boys and girls of this age have been ABLE to come to the place of real repentance — but these are few and far between, indeed. Baptism should be done as the result of complete and total REPENTANCE toward God and complete faith in the blood of Jesus Christ! Only a mature mind, one which can truly "count the cost," should consider baptism! But what about YOU? Have YOU been baptized? Was it done the WAY God commands? Did you really REPENT first? Did you know what repentance is? Did you know what to repent of? Did you really KNOW exactly what sin is, according to the Bible? Did you come to feel deeply broken up over your past way of life, the method you used in conducting your private affairs, your business, your home? Did you become so thoroughly DISGUSTED with yourself, your very nature and personality, your habits and methods of expression, that you simply couldn't stand to live with yourself any longer? Did you not only feel this as a deep and very real emotion, but did you thoroughly UNDERSTAND that you must yield in complete OBEDIENCE to God and His Law? Had you really come to Jesus Christ in UNCONDITIONAL SURRENDER of your rebellion against GOD'S WAYS — had you thoroughly repented of going with the WORLD? Did you understand, fully, that you were being RIMED, and that a "new you" was to emerge from the water? Did you really "count the cost" (read Luke 14:25-33) when you were baptized? Perhaps you are like many who have written to us. They can "see" many new truths by reading The PLAIN TRUTH magazine. 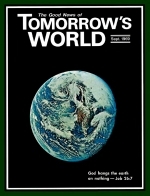 They listen, and they "agree with" many things they hear on The WORLD TOMORROW program. Perhaps, many, many years ago they were "baptized." This may have been during a revival, at a tent camp meeting, at the local church, or even when they were an infant. They realize there was no really DRAMATIC CHANGE that took place in their lives when they were "baptized," but feel "satisfied" since they are now learning some new "points of truth." But THIS IS NOT ENOUGH! Remember — and never forget that BELIEF without OBEDIENCE is not enough to get you into God's Kingdom! Even the demons "believe" and tremble! (Jas. 2:19). Satan the Devil is the greatest "fundamentalist" of all time! He believes Jesus is the Christ. He BELIEVES in the virgin birth, the temptation and trial of Jesus, the crucifixion and resurrection of Christ, that Christ ascended to the right hand of God the Father, and that He is coming again! He BELIEVES in ALL the essentials of salvation! He KNOWS they are true — but he WON'T obey them! Belief coupled with OBEDIENCE is necessary to gain the Kingdom of God! What about it? Are you being truly honest with yourself?